After a long conversation with an Ocean Isle Beach native working the meat department at the town grocery, he assured me that not only are alligators good eating and taste like chicken, but they get ’em fresh from Georgia, which from my calculation was two states away. Me: Will they chase us on bicycles? Me: You, mean, while we’re riding our bikes, they’ll come out and chase us? The Butcher: No ma’am. Only when you stop. And that made today’s riding plan simple. There would be no stopping. Not ever. Not once. Mostly, not at all. 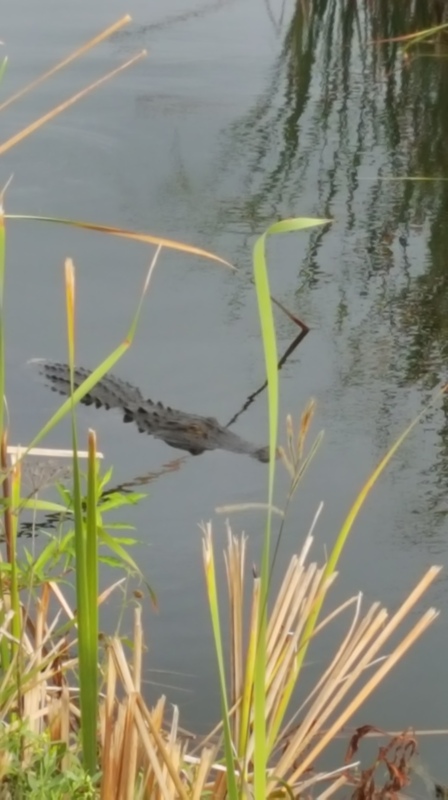 Ok, maybe once should we arrive at a sign that said, “Don’t feed the alligators”. No more than 10 miles into our ride, we arrived upon a lake, or a swamp, or clearly an alligator hole, because the sign said so. Naturally, we all got off our bicycles and approached the swamp to get a photo op with the warning sign. 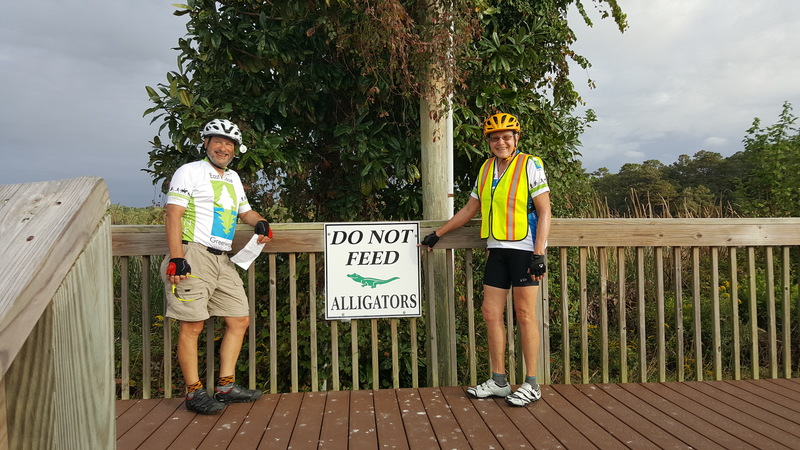 More members of the East Coast Greenway Way tour rode in, and again, naturally, everyone dismounted for that alligator sign photo op. Then, someone noticed the water move. A head appeared, looking like a slow-moving log with a bad case of acne. It approached our group, stealth like, undaunted by our bright colored bike wear, and we maintained a distance, quite a lot of distance actually, still close enough to zoom in with our cameras and confirm – this was not a chicken. I decided it was a good a time as any to re-mount our bicycles, and take off, and others thought the same. We left that gator with a dust-storm as our wheels spun out in the sand, and I kept thinking about the words of The Butcher from Ocean Isle Beach. Someone should tell him that they don’t need to import alligators from Georgia. That all changed. Suddenly the bicycle GPS was insisting on turning where there was no road. The humidity was overpowering, and water bottles emptied at an accelerated pace, our group got separated on a confusing turn, and one of our bike-mates (Dexter) ran over a large nail. We marveled at the speed in which Dexter changed out the busted tube for a fresh part. Unfortunately, he wasn’t fast enough. The minute we returned to riding, the rains appeared. Not just sprinkles and mist, but the kind of rain that hits your bare skin and leaves dents. The kind of rain where you feel compelled to take cover, even if means standing under the roof of a gas station, for an hour. Or, more. 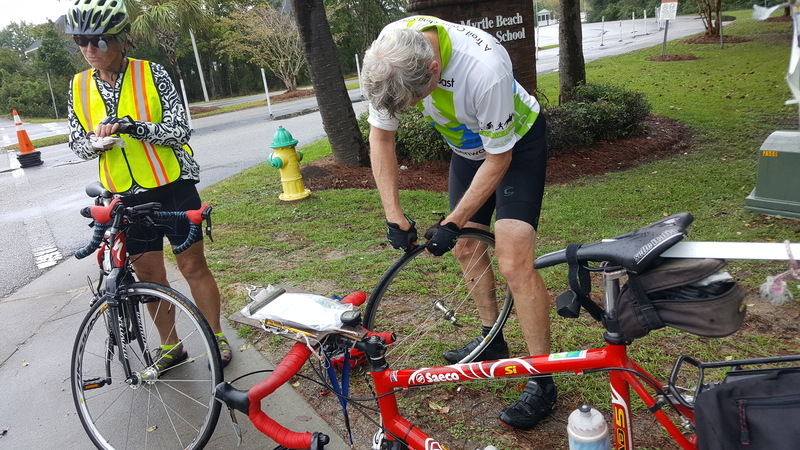 Eventually, we decided the torrential rains had no plans to stop, and with 6 more miles to go, we returned to our bike saddles, and rode through South Carolina’s low-country. Low country for bicyclists is a whole new form of transportation. With water pooling to mid-thigh levels, we learned to pedal with your feet under water, and some of us had so much fun with that we considered just riding through the lakes and whooping it up. Others in our group suggested it might be more appropriate to beeline it to our hotel. 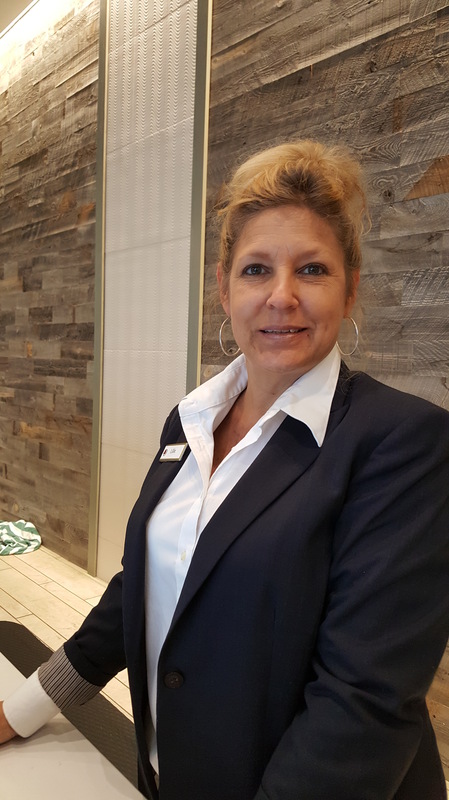 Our inner-child gave way to rational thought, and cold and soaked, we arrived at the Doubletree Hilton in Myrtle Beach, where we were greeted by Lillie. Lillie embraced us with the finest taste of southern hospitality: warm towels and fresh chocolate chip cookies. Soon we warmed, smiles returned and we were back to trading stories on another day of outstanding adventures only to be uncovered through bicycling. Brilliant & Very Very Funny ! Thanks Jane! Your blogs are excellent. It was a tough route this year – made only palatable by the group staying together on those highways – and of course the nice and patient people we now ride with each year. We missed you this year Buzz! Hope we see you next year. Enjoyed seeing you on the NYC Five Buroughs Ride. Thanks so much for your wonderful blog and information. I’m reliving last week all over again! Loved the entire week! I especially loved our ride to Myrtle Beach in the rain… at first I was frustrated but then started laughing at the absurdity of all of us riding in the extreme rain! One of the most unique experiences of this ride was when my lower foot on my pedal was underwater! Never done that before!! Also, loved the warm greeting and towel by Lillie at the Doubletree!